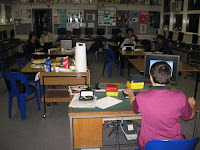 The photo above shows teacher PD on game making being delivered by a year 8 student at Westall SC on 22/5/07. Involving students in teacher PD can place PD in an authentic context for teachers, PD otherwise often results in inert knowledge. See GenYes for more "Students work with teachers to bring effective technology into the classrooms and libraries. The resulting collaboration provides the students with project-based learning and the teachers with on-site, sustainable professional development." teachers in their ICT skills" at the ICTEV conference on 24/5/07. "Are you aware of the children’s confidence and skills with ICT? Why aren’t you using it? This presentation explores a research project that utilises the confidence and skills of students in grade 3/4 to mentor staff in the use of the ICT available in their school. The positives for the staff, students and their relationships are discussed."